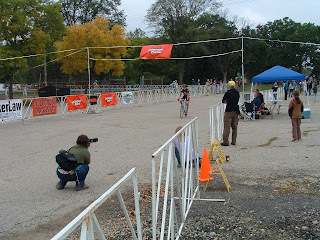 Well, the first two races for James on his new Ellis cross bike couldn't have gone better. He e-mailed me on Sat. evening to say he'd won the Cat. 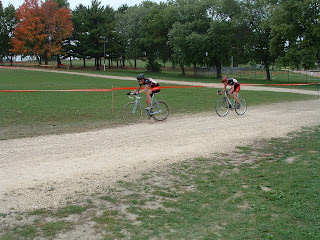 3 race in Sun Prairie, Wi. Today Lisa and I drove out to watch the second race of the weekend at the Angell Park Speedway and root James on. There was some early jockeying for position, James is the last one in line here. 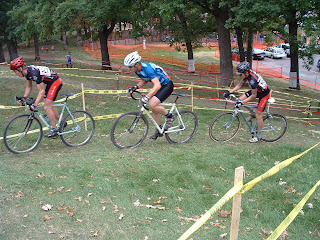 A shot of the remount after the only set of barriers and subsequent run up. 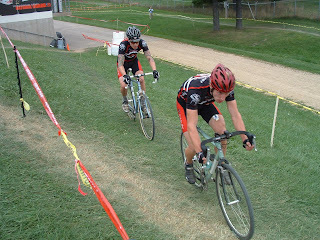 James and his Velo Trocadero teammate pulled away from the pack and rode together for most of the race. Here they are on the deserted far side of the course. James leading as the race nears the end. 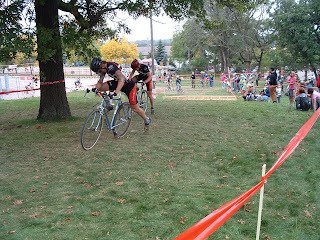 The finish, James and Ellis Cycles rack up win #2. 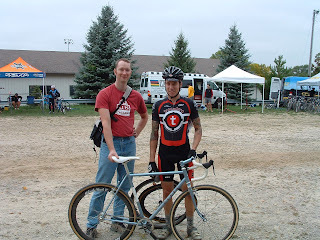 James and I pose for the after race shot. 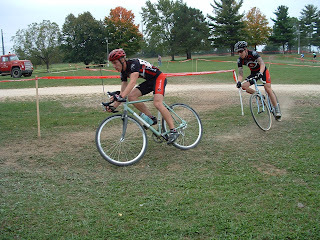 I must say, it was pretty cool watching James win on one of my bikes. Now the question is, will James upgrade to Cat. 2 for the rest of the season? 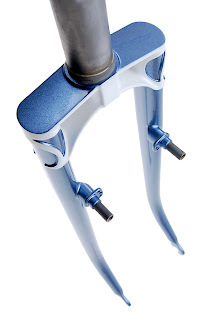 I'll keep updating as the season progresses, maybe you'll even see some shots of me on my cross bike!? 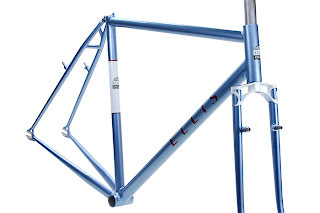 Looking forward to the Ellis Cycles jerseys too!! 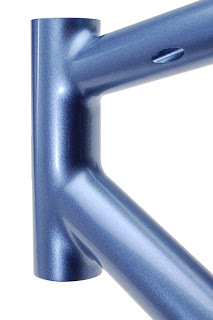 Here's a bunch more detail shots of the fillet cross frame. Should be ready for racing this upcoming weekend in Sun Prairie, WI. 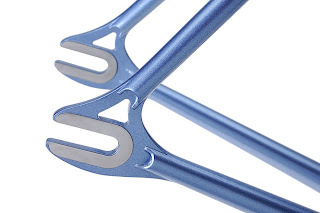 Pacenti dropouts with stainless faces. 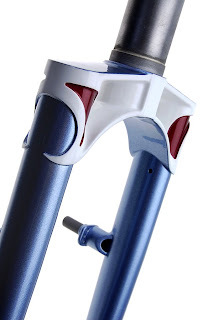 There's that internal brake routing. 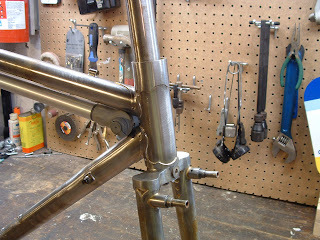 I did a "bi-laminate" seat lug by cutting the socket off a Sachs seat lug and filleting the top tube in. 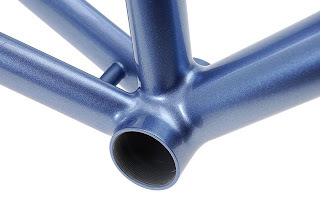 Nice clean fillet bottom bracket. 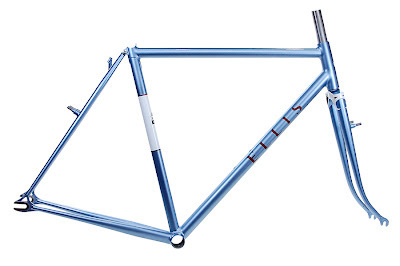 James' cross bike is back from paint and ready to tear it up. Should have more pics soon, these are to whet the appetite! The front windows are blue, the rear ones red. Awesome work by Jason Sanchez. 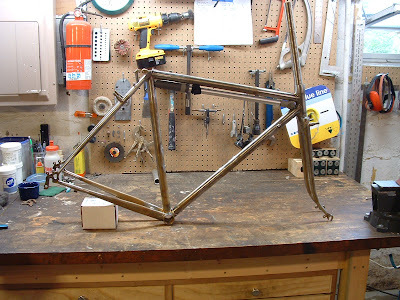 Doug's Frame, Ready for Paint! 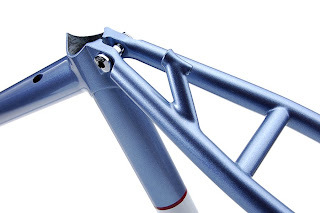 I finished up the final bits on Doug's frame today and I'm already started on the next Ellis in line. I sent Doug all the photos I took today, I'm sure he'll post a bunch, check here : http://mnbicyclecommuter.blogspot.com/, in the mean time here's a couple of my favorites. 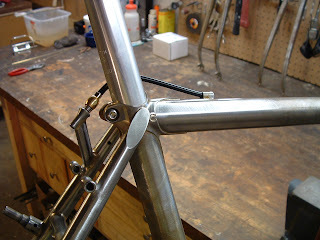 Doug wanted the frame built for Paul's Racer brakes, but with a small bike it's always a challenge to find enough room for the seat stay cable stop. 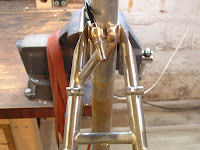 I tried to leave plenty of room for the rack struts and the brake straddle cable. 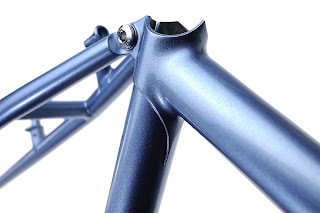 Those studs always look a little funny that high on the fork!